Okay I might as well start this fire, but while we all know that the scale for Huge ships and many other ships for X-wing has been adjusted to a feel good scale. I was wondering could you take say a 30" Star Destroyer model and will it fit into X-wing? Now I know people will be saying that is too big for even the 3'x6' (36"x72") mat soe say a 6'x6' mat instead (this might be a floor game) Anyways I put up an idea for what I think the base of a Star Destroyer may look like. I think it is doable, the dial would be rather limited No 2 banks or 4 straight (but may use obliques or even double banks to compensate). The idea is a 3 section huge ship. The Weapons and docking section in the front. The Bridge section which is the back part using a divided section to act as the top (see tokens in influence zone) and an Engineering section which is the complete back part. In the influence zone ships will take a token and put it either on top or bottom stating which position they are in. Top part leaves them exposed to more weapons from the front but is also allows them to attack the bridge, bottom part is safer from weapons and is also the docking zone for friendly fighters. Another idea is to make this a 2 ship kit. So there will only be one model but the ship will have 4 section cards and 2 dials depending on what type of Star Destroyer they want. They can take the cheaper Victory class which has a slower dial less energy and a bridge that has energy instead of firepower. The Imperial Class has weapons on their bridge a better dial and more shields. So again, does this seem like a feasible plan for a Star Destroyer in Epic? If so this could be adapted for Mon Calmari Star Cruisers and other Capital ships that are not Dreadnoughts (we can just go with a place mat for that instead). Please comment below, like or subscribe. In my world its not. Nicely done. a star destroyer in scale is 15 feet long. So yeah, unless you want to put my ford Transit cargo van on the table, its utterly ridiculous. but what if we scale it to 30 inches, yeah I know the Falcon seems larger than the bridge windows but really it is still puny when set up next to it. Also scale is a relative term in X-wing now. Maybe back in Wave 6 when scale was still something to worry about but now scale is flexible, granted this is bending the limits quite a bit, I think it doesn't necessarily break immersion. That's the right size for a Arquitens, but an ISD is bigger than a double board edge. As a model, yes, way to big. As an element of play, go for it! Furthermore, lots of people have incorporated the Revell model into their game very creatively. Mostly, though they have called it a pocket-star destroyer as a nod to "this is way out of scale." For me, the Star Destroyer is a (usually off map) scenario factor. Much like in some of the Epic campaign material, it deploys targeting tokens to the map and fires flak/anti-aircraft batteries into the battle. I did build a small fragment of a Star Destroyer which could be deployed in the Imperial deployment zone, occupying a section of the corner with a few weapons hard points. Each weapon in that case had a fixed 90 degree arc, with some overlap, and had to be filled buying weapon hardpoint upgrades to use. Basically, the small hull section served as an immobile deployment point for Epic weapons. Assuming the Rebel/Scum had any sense, it only really works in scenario play, as in a simple death match, the rebels can simply stay away from the immobile arcs, and the Empire therefore wastes pints to make part of the map less usable. The problem with sliding scale on the size of an ISD, is that you have to slide an ENORMOUS amount. Like, we all have the iconic moment burned into our brains, in which the Devastator swallows the Tantive IV as a whole. After that, seeing an ISD which is only 2 or 3 times the size on the playmat, next to the Tantive, it would look... strange, to me at least. Not to mention, it should utterly obliterate other epic ships, while being next to useless against fighters... Which already questions its sensibility in any epic list. I'd appreciate an Arquitens or Nebulon-B, or Lancer or any other corvette more. For true capital ship engagements, there's Armada to play. This is my pocket star destroyer. You can see that, even though it is way off scale for a "real" Star Destroyer, it still dominates the table and gives off the vibe of Imperial Grandeur in the spirit of a Star Destroyer. In the linked post I show it next to a CR90 and in a simulated battle scenario against a squad of x-wings. This certainly doesn't replace an actual Star Destroyer, I just wanted a way to bring the iconic image of Imperial might to the table. No ship is too big to play Epic. That’s what basketball courts are used for. Okay, that is prety sweet. 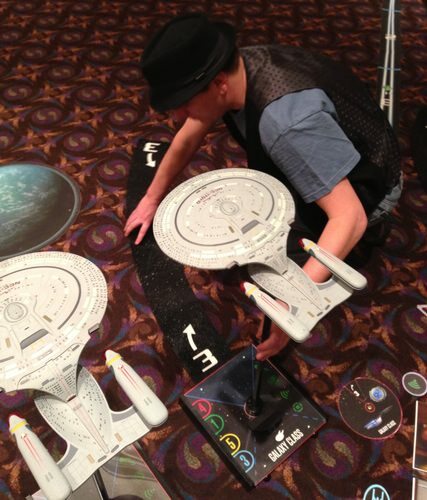 Although I still think Star Trek is better suited for Armada rules than X-wing rules. I think that X-wing isn't really mechanically designed to accept even 30" models on the table. For one, the sheer displacement of a bank manoeuvre would crush any ships at range 1-2 on either side, forcing attackers to stay at long range, lest they be crushed fruitlessly. In addition, how would the weaponry work? Fixed firing arcs don't really apply to the dorsal weapons, since they rotate through a nearly 360 degree arc. Any turbolaser blast is either going to destroy a ship outright or miss it entirely, leading to very swingy luck. I think the limits of X-wing are the Nebulon B sized capital ships. You could probably include Lancer-class Imperial ships for faction balance, too. Really, if you want capital ships, Armada is the game to go for. 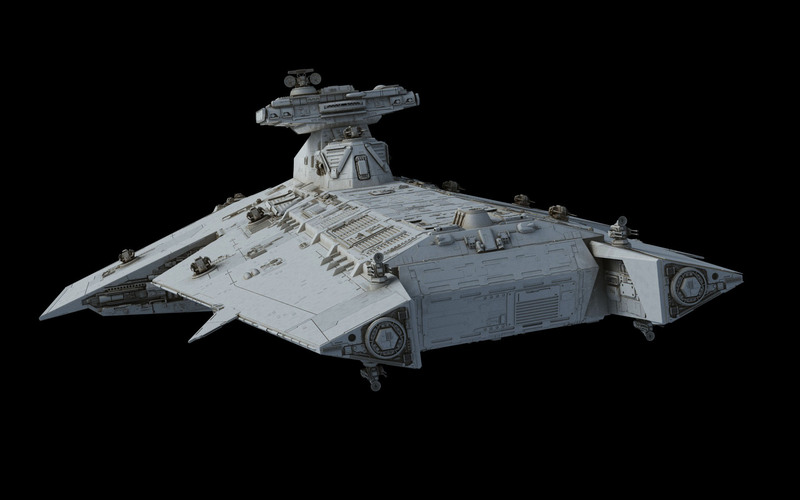 Find 'top elevation' images of an Imperial II Star Destroyer and a MC-80 Mon Calamari Cruiser. Print on an epic-sized game-mat such that range 1 of the board edge for the entire length of the board is recognisably filled with the edge of a capital ship. Dogfight is occurring between two capital ships slugging it out at (for them) point blank range with battleship turbolasers and ion cannons. That is the most ridiculously oversized game of Attack Wing ever. I did that in one of my very first attempts at writing scenarios. The limiting factor/asset management part of the campaign is that the starfighters were based on 2 capital ships. The ISD and MonCal were sending out their fighter complements in sorties, so they were very much a defining aspect of the campaign, but never appear "on screen." I think one thing would be that Imperial players would love to have a Huge that nods to the design aesthetics of an ISD. I like the Raider, but it looks like an stunted ISD crossbred with a TIE fighter. I'd love a design that had a massive conning tower and round shield generators: something closer to the ISD look. Well the idea is in abstraction which X-wing is. As much as one person talks about scale to be honest you can play without the models. All you need is the base the cardboard tiles, the cards (although that is obsolete so get a printout instead) damage deck, maneuver templates, and dials as well as any tokens (or any substitute) and mechanically you have everything for X-wing. There will be hardpoints as well as primary weapons and firing arcs. For dorsal well that is the fore and aft section on engineering, for prowl we can add the bridge section for those. Yeah, I'm thinking if you really want the feel of an ISD in Epic, try a Arquitens-class command cruiser. A kitten model would be about twice the size of a Raider or CR-90 and take up the lion's share of a board by itself. An ISD is better used like a set piece, just a chunk showing with gun emplacements, or off-map with some gameplay effects. When I first started up with X-Wing, there were pictures from a local group's facebook page with X-Wings and Ties at this same scale and guys were playing on the lawn. About 2 weeks later that store went out of business, their page was closed and I haven't found those pics since. Run it like a D&D game of old: 3 part campaign. Weekend 1) attack the shield generators. Use the whole mat as the the ISD. Just don’t scale it down to where it could fit on the mat. These are supposed to be huge. a lot of people, myself included, play miniature games because we're visually oriented. The games scale is the primary selling point. this is a dogfighting game about small manueverable craft, there is no reason to force something that doesnt fit.